This is our first devblog, so we're going to introduce ourselves. Tito - He is a programmer that also does a bit of art, and game design. Anebur - And this is me. I'm the game designer, and the second programmer of the team. We want to make this dev blog a simple what-we-made-till-now posts, with some talk about what we want to make, or what we are going to make. Let's start with our first entry then. we need to change the code and build. a simple way to save the game, and the moment we start the multiplayer phase, it will help us a lot when synchronizing everything. So, the most viable option is a SQLite database. Small, fast, and flexible. The first thing to do is convert aaaall the data to models, which are going to extract the data from the database. That will take a lot. Tito has been working on the side effects of flammable things. For example Coal: it has a durability wich decays when burning. There are other objecs, like wood, that need a "burnt" effect, a "blackish" wood texture. that will change the alpha depending on how much time it has been exposed to fire. 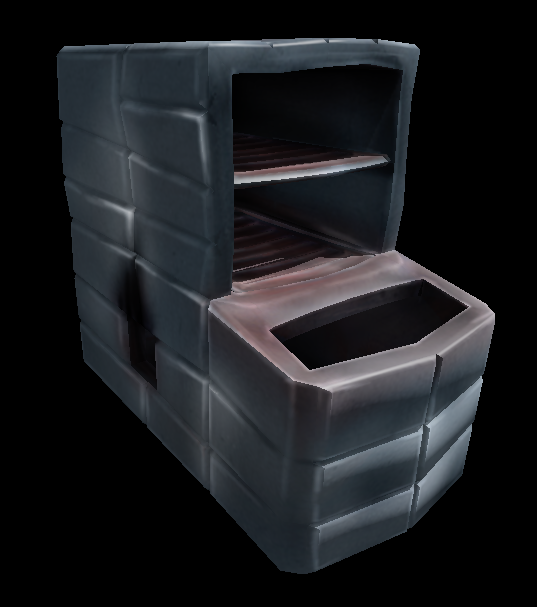 DokZau has been working on a remodel for the furnace, it needs a dirtier look. Also, if we need to add more tools to the process, maybe some sort of pegboard to hang tools will help, DokZau is on it. We made a post on reddit asking for opinions about the current state of blacksmithing, and gathered some interesting ideas. - We need more steps in blacksmithing, or some sort of "advance blacksmithing" where the player can make extra steps to improve the final result. Change some little things on how the actual blacksmithing process works right now.